I know it’s my tendency, and that of other beer writers to focus only on beers that pass personal muster: new world IPAs, sour beers, perhaps discovery of a well hidden mild or brown ale and certainly not laaaager, dear boy (well, not the factory brewed lager anyhow). And if they (read: ‘I’) do write about lager it has to be ‘proper’ lagered beer; ideally all malt; hop restrained, double decocted and most, most, definitely lagered for a minimum of a month, ideally in a Bavarian or Bohemian cave or troglodytic vaults below a castle. For the record they do exist, and yes, the beer is better (in the main). When I set off on the Tinted journey though I wanted to reflect a personal stance in my writing. It was, and is, ‘pro beer’. That is to say, whilst I may not enjoy or condone the beers and brewing practises of some breweries, typically those focused on a volume growth agenda and therefore targeting efficiency and profit over quality, integrity and craft, I wasn’t going to slag them off either. At least, not unless there was a clear rationale, a basis of a subjective truth; a deliberate contradiction in terms, I know. Goodness, I worked for a national, now multinational brewer for almost two decades and hypocrisy stinks: I am free to vote with my wallet and tastebuds and that’s what I have chosen to do. At the end of the day though, for a normal person, beer is beer is beer. If people like me piss in the proverbial pot it pollutes the whole thing. And today is one of those days that justifies my stance. I am in the Canary Islands. My wife is swimming a staggering amount of lengths in the pool outside; the kids resting under a metaphoric shady tree for it’s 29 degrees, with a cooling breeze off the ocean, that oftentimes whips into violent, short-lasting squalls, hurling inflatables, whistling at windows. The landscape is stark but not bleak: this island is volcanic, the rock is young, black basalt, with deep holes where the gas and air hissed out as it cooled. Ever ingenious, man has worked with it; walls contrast in white; plants are tolerant of both drought and malnutrition, houses are concrete slabbed & whitewashed, unheated, airy. Water is scarce compared with our blessed isles further north. In short, you perspire just walking to the shop at 9am; air conditioning is blessing, a dip in the pool more so; a swim in the sea most of all. That’s not to say that you couldn’t enjoy more beers here. Sadly perhaps, I love shopping on holiday (or on business trips away), it’s a short cut to local culture. And the beer range always depresses me around the mediterranean shores just as it does here too. Quick brewed, pale beers, 50 shades of magnolia. Lager by name but rarely lagered by nature. Yet, in an environment where you sweat just sitting outside, there’s something right about them. The alcoholic level isn’t debilitating; refreshment is promised and is delivered. As I type, I am drinking a Cerveza Dorada. It’s 4.7% ABV and it proclaims on the front, so I assume they deem it important, that it’s “100% malta”. 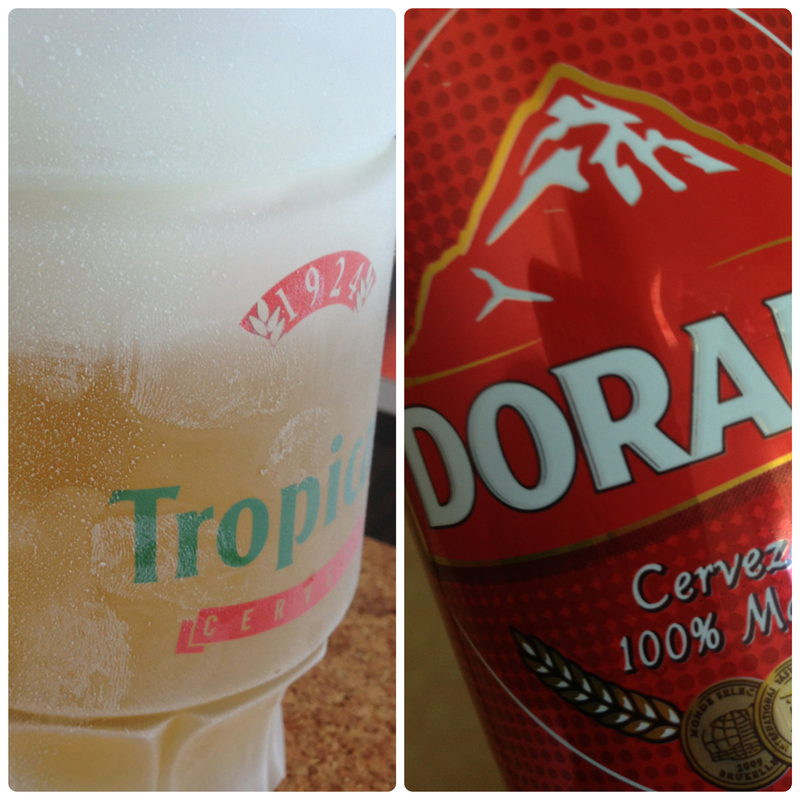 Our apartment had some ‘Tropical’ beer steins, so I popped them in the freezer. Heavens! Heracy! A factory brewed beer, chilled to nut numbing temperature in the fridge and then poured into a frozen glass. But here’s the rub. It’s great. The glass is exciting (no, really), steaming as the ice formed as I drew it from the freezer drawer; pouring the beer, you could hardly make out the amber body for the frostiness on the outside, I feared my lips would meld onto the rim. But no, it melted away and left gossamer strands of ice on the head of the beer. A beer which was OK by the way: it doesn’t profess to be an earth shatterer, and I wasn’t seeking perfection. It was a good beer, on a great occasion. And it was… right.